Want to master the art of connecting with wave, or find out why you should trust your eyes, not the altimeter? Interested in the sailplane that’s setting new standards, or how one club saved funds with a reconditioned winch? Take a look in the October-November issue of S&G. 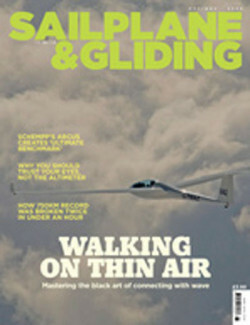 Our front cover shows Steve Derwin discovering just how much fun wave flying can be during Edensoaring’s open week. After what seemed like an eternity of trying to master the art of connecting with wave, Steve found that it’s a bit like waiting for a bus. When, eventually, one came along (a wave flight, not a bus! ), it was followed by two more in quick succession. Record breakers also followed in quick succession recently. A 757km flight on 14 June entitled 22-year-old Tom Smith to therecord for youngest 750km. Forty minutes later, 21-year-old Will Chappel landed out in the same field as he had in a failed 750km attempt two weeks earlier but, at 768km, his flight made him the new record holder. 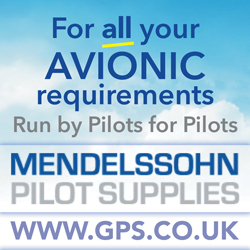 When faced with landing out it pays to have read the second article in Steve Longland’s series on aircraft instruments, in which he explains how the altimeter works and what it measures. Your chosen field could be hundreds of feet above or below the point from which you launched, but unless you know the local QFE you won’t know how great a disparity there is between what your eyes tell you (which – low down – is likely to be right) and what the altimeter is saying (which probably isn’t). Jochen Ewald has been feasting his eyes on Schempp’s Arcus with its elegant new wing shape. He says that it offers gentle flying characteristics and single-seater handling qualities similar to those of a 15/18m glider, providing real fun for its pilots – even if they are not competition pilots pushing to win. This eyecatcher is said to be the new ‘ultimate benchmark’ of the 20-metre two-seater class and likely to prove a great challenge for its competitors to equal. 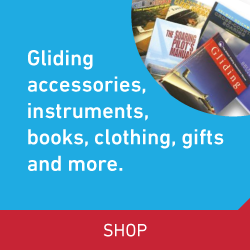 Also in this issue: BGA Chairman Patrick Naegeli reflects on how we have everything we need to continue to make successive ages of gliding golden. BGA Development Officer Alison Randle looks at the do’s and don’ts of communicating bequest possibilities. Surrey Hills GC tells the story of its ‘new’ winch. Pete Stratten looks at the need to act accordingly on individuals’ needs in order toincrease participation. Loek Boermans concludes his series on how recent aerodynamic developments at Delft University are being applied in high-performance sailplanes. Sarah Kelman relives her experience as the ‘token girl’ at the World Air Games in Turin, while Ed Johnston shares his tale of borrowing a glider to compete at Nitra. Two young pilots talk about their scholarship experiences and Southdown GC celebrates the centenary of the world’s first recorded flight. Wally Kahn takes a look at Matthew Freudenberg’s book Clear Air Turbulence – A Life of Anne Burns.